Just take your time – wave comes. Let the other guys go, catch another one. When the sets are few and waves quite far apart it’s easy to get caught up in “needing” one – NOW! Mmmm, kinda reminds me of life. You too? 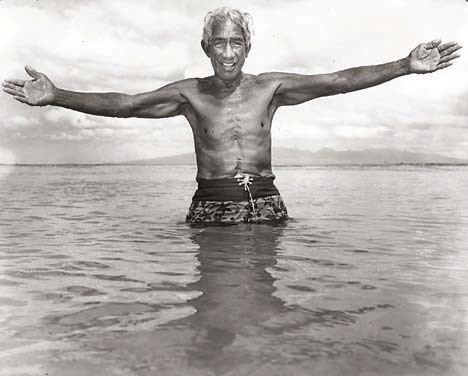 You may want to read about our buddy, Ka’ai Bruhn who grew up close to the Kahanamoku family digs. This entry was posted in Hawaii, People and tagged Duke Kahanamoku by Water Words. Bookmark the permalink.